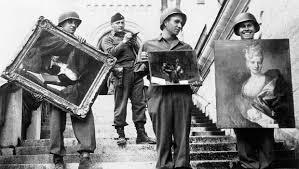 During World War II, the Roosevelt administration established a government commission, nicknamed the Monuments Men, to rescue historic paintings and monuments in war zones. Refugee advocates urged the administration to take a similar interest in rescuing Jews from the Nazis. President Franklin D. Roosevelt asked Supreme Court Justice Owen Roberts to chair the commission. Two months earlier, Roberts had turned down FDR’s request to chair the U.S. delegation to the Bermuda conference, on the grounds he could not spare the time. However, he readily agreed to chair the new team for rescuing artifacts, which came to be known as the Monuments Men. The Roosevelt administration dispatched Assistant Secretary of State Breckinridge Long to Capitol Hill to testify against Bergson’s rescue resolution. Long declared that the United States was deeply concerned about the Jewish refugees, but after all, “you cannot send a regiment in there to pull people out…” They did, however, send in U.S. personnel to pull paintings out, critics noted. In early 2014, George Clooney directed and starred in a dramatic movie, “The Monuments Men,” which brought the story to wide public attention and turned the book on which it was based into a national best-seller. Neither the book nor the film devoted more than a passing attention to the Jewish refugee issue. Wyman, The Abandonment of the Jews, pp.108-109.